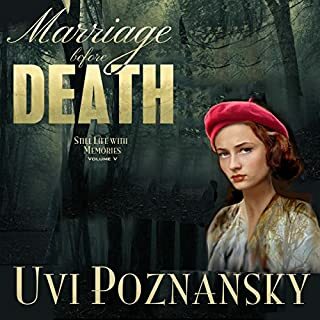 Marriage Before Death,Still Life with Memories, Book 5 by Uvi Poznansky is a fun, fast paced WWII spy thriller with a bit of romance thrown in. If you like stories that take you back in time and show you how a particular story could have gone, then you'll likely enjoy this book. There's an American, the French Resistance, Nazi's, war...this book has all of the necessary elements to keep you listening until the end! Don Warrick's narration wasn't bad, per se, it just didn't fit this book as well as I had hoped. His diction and cadence were great and he did a solid job with the various accents of the characters, but there was enough of the book where it was Rochelle/Natasha speaking, and I didn't love his female voices. This is a fairly minor thing though, so if this story sounds good, don't let it deter you too much from listening! I was voluntarily provided this free review copy audiobook by the author, narrator, or publisher for an honest review.